GRILL DIRECTIONS: In small bowl, combine all marinade ingredients; beat with wire whisk until well blended. Keeping strips connected at one end, cut chicken breast halves lengthwise into 3/4-inch-wide strips, cutting to within 1/2 inch of one end. Add chicken to marinade; turn to coat. Cover; let stand at room temperature for 15 minutes to marinate. Meanwhile, in small bowl, combine mayonnaise and 1 teaspoon honey. Heat grill. When ready to grill, remove chicken from marinade; reserve marinade. Place chicken on gas grill over medium heat or on charcoal grill 4 to 6 inches from medium coals. Brush chicken with reserved marinade; discard remaining marinade. Cook 6 to 8 minutes or until chicken is fork-tender and juices run clear, turning once. 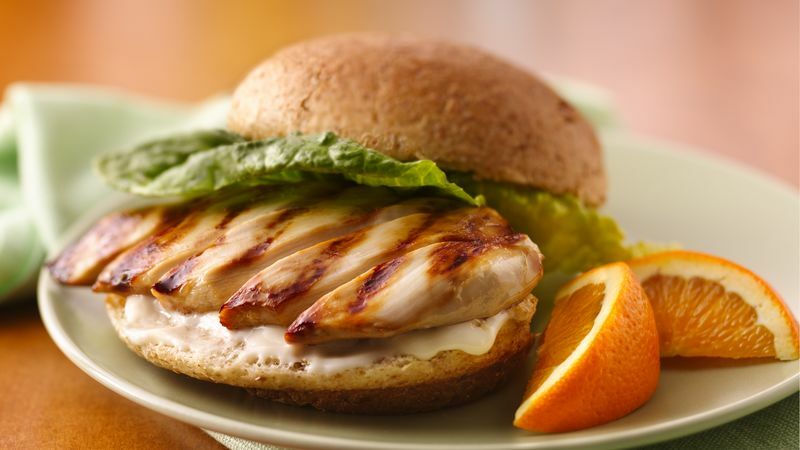 To serve, place chicken on bottom halves of buns. Top with lettuce, mayonnaise mixture and top halves of buns. BROILER DIRECTIONS: 1. Marinate chicken breast halves and prepare mayonnaise mixture as directed above. Place chicken on broiler pan. Brush chicken with reserved marinade; discard remaining marinade. 2. Broil 4 to 6 inches from heat for 6 to 8 minutes or until chicken is fork-tender and juices run clear, turning once. Continue as directed above.